We all know the reason many people have for not wearing shoes covers: they look silly. But for those who choose, or are required, to wear them, shoe covers are not about aesthetics, they’re about making sure workers can do their job responsibly and professionally. Choosing to wear shoe covers is about taking into account all the small details. For some, these ‘small details’ can mean the difference between success and failure, for others it can simply mean standing out from the crowd by making sure customers have no complaints. Shoe covers are one of the tools the detail-oriented use to make sure the job is done right, helping workers keep their mind on the job, not the footprints they’re leaving. The benefits of wearing shoe covers are many. We’ve collected a few below to help you understand how shoe covers can make your life easier, and your quality high. No one is out there trying to make sure their work boots are in perfect condition. However, for some professionals, like surgeons, their work conditions may have them standing in blood, or worse, while they do their job. Feeling a stranger’s blood squish between your toes, or putting on shoes likewise stained is more than simply unpleasant. When working in areas or rooms that threaten to create a mess of your footwear it can create extra work. For many in this category, constant cleaning becomes a requirement if shoe covers are not used, wasting hours in the long run. Added to that, this messy footwear will create tracks that need to be cleaned as well, and even put off clients, customers, or the family members of the person you just did surgery on. Sometimes it less about you, and more about the room. For people working with machinery or animals in a sensitive setting, shoes covers help you protect the room from the bacteria and dust on your boots. In cases such as these, shoes covers can mean the difference between success and failure. Often times, companies or workers will default to extra footwear or footwear cleaning. However, the excess cost, time, and knowledge required (for proper cleaning) makes these options less palatable. 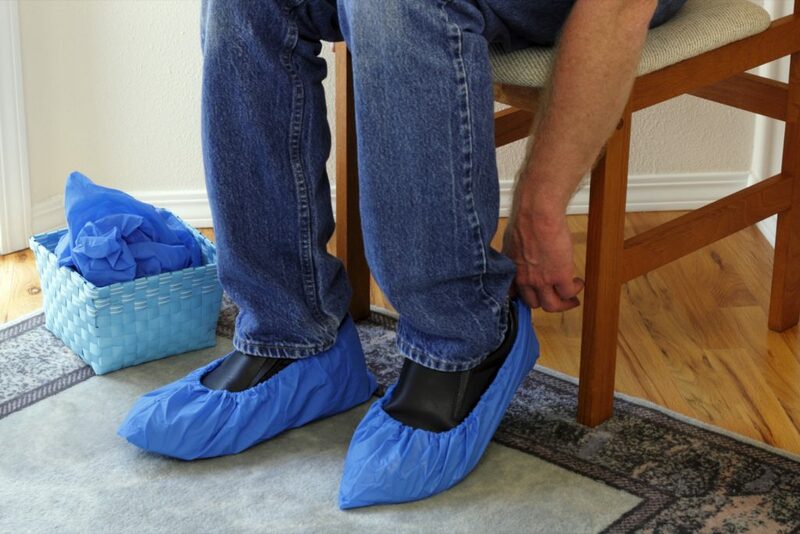 Shoe covers allow you to mitigate concern with visitors, and new or temporary workers, by making the requirements for cleaning less onerous while maintaining cleanliness/sterility. With industrial gardening, for example, employees move from garden to garden, risking cross-contamination between areas if proper procedure are not applied. That could mean the movement of insects or diseases from plant to plant spreading infestation and harming crops. In this case, the worker is doing more harm than good. However, shoe covers keep both contamination from shoes, and contaminated shoes from spreading the disease. In some countries, like our neighbours to the south, wearing shoes indoors is completely acceptable. For Canadians, however, watching people, especially contractors with their clunky work boots, come in without removing their footwear is disconcerting, or even considered downright rude. But for some homeowners, the slight is much worse. Some religions have stipulations regarding the footwear you can wear in a home, or a particular room. In cases such as these, walking in without consideration. By donning shoe covers over your footwear, you are showing respect and regard for your client and their property. It’s details like this that divide the quick and dirty from the clean professional. Your boots are more than a piece of your wardrobe, they’re an important part of keeping you safe on the job, an integral part of your PPE (Personal Protective Equipment). And taking off PPE is never a good option. While many places are not fit for a contractor’s clunky work boots, a contractor’s job is not fit for sock feet. By slipping shoe covers over your boots, you can alleviate both problems, keeping your feet protected, while maintaining a clean environment for your customers. Whether you’re a cleaner who’s just shampooed the carpets, or a real estate agent who’s leading groups of people through your listing, the flooring of your workplace can be incredibly important, especially when the condition of the flooring is part, or all, of what you sell. Shoes covers can help to protect the flooring, keeping hard soles from scuffing on tiles, or prematurely wearing through carpeting. Time is always of the essence. Every worker has another place to be, another job to do, and the faster they can move between jobs, the faster the work gets done. There are many industries, where cleanliness is a driving factor, and dirty work boots cause problems. While there are various options to combat the spread of dirt and germs, not are as quick and easy as shoe covers. When comparing them to rinsing, or changing your footwear, shoe covers are faster and easier than the alternative. That time turns to money, and the ease of used means there’s less chance of workers stumbling, tripping or falling on the job. Both of those are wins for any company. The biggest reason to wear shoe covers, is that it is an effective tool in your kit for keeping your work area, and your shoes clean, telling your clients, your employees, and everyone else that your company is one that cares about the detail. Don’t let small consideration keep you from accessing every tool you have to make your business the best it can be. With the help of shoe covers you can save time, save clean up, and impress clients and customers. For some of the best quality and best prices on shoe covers, check out our shoe covers for sale here. And feel free to give us a call or send us a message if you have any questions!